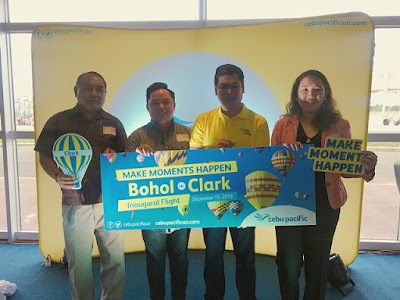 Aviation Updates Philippines - Cebu Pacific, the leading carrier in the Philippines, begins commercial operation of its daily flight between its hub at the Clark International Airport in Pampanga and the Bohol-Panglao International Airport. The new route is part of the carrier's expansion plans for its Clark hub to cater to the catchment areas in Northern and Central Luzon. CLARK HUB EXPANSION. Cebu Pacific launched direct services between Clark and Bohol-Panglaon on Saturday. Photo by Cebu Pacific Air Corporate. Further, the route is expected to stimulate domestic tourism between the Visayas, Central Luzon and Northern Luzon; as well as provide support for the growing Meetings, Incentives, Conferences, and Exhibitions (MICE) tourism sub-industry. The daily Flight 5J 613, bound for Tagbilaran (Panglao), is scheduled to depart Clark at 955am and arrive at 1120am. The return flight, 5J 614, is set to depart Bohol at 1150am, and arrive Clark at 115pm. The flights are operated out of the new Bohol-Panglao International Airport. "We are excited to commence operation of our newest route in Clark. As we expand our route network, we look forward to supporting economic growth in Clark and its surrounding areas, as well as in the province of Bohol through tourism and logistics support," said Dindo Fernando, Director for Airport Services at Cebu Pacific. Cebu Pacific started commercial flights out of the Clark airport in 2006, and it has served as its North and Central Luzon hub for the past 10 years. CEB utilizes its fleet of Airbus aircraft for flights in and out of its Clark hub. Cebu Pacific has increased its frequency out of its Clark hub by 75% this year alone, bringing the total number of flights in and out of Clark to 3,711 by end-2018, representing 620,540 seats. Aside from Tagbilaran (Panglao), Cebu Pacific flies daily between Clark and Davao; twice daily between Clark and Cebu, as well as between Clark and Hong Kong; and daily to and from Singapore and Macau.